ALEXANDRIA – One of the toughest things about coaching can be earning the respect and trust of your players. But 1997 Highlands graduate Stephen Lickert seems to be doing that wherever he’s been a head coach. Lickert, 34, owns an overall record of 48-51 after nine seasons as a head coach at three different schools. But that record could improve dramatically if the upward trend continues. Lickert walked into rebuilding situations at Dayton and Covington Holmes and turned those programs into respectable after three seasons. He’s hoping to take another giant step in his third season as head coach of the Campbell County Camels this season. It also helps the Camels will play in a new stadium right on campus. The former Highlands running back and inside linebacker took over the Camel program in 2011. Campbell County has won the Class 6A, District 6 championships in both seasons under Lickert. The first district championship came despite just three wins in the regular season. That marked the first district title for the Camels in 31 years. The Camels have lost in the second round of the playoffs both years. They fell 20-7 to Lexington Lafayette in 2011 and 29-21 to Simon Kenton last year. But the two second-round playoff appearances marked significant achievements for the Camels. Campbell County had only been to the second round twice before that in 2010 and 2006 dating back to the 1998 season. Last season also marked the most wins in a season for the Camels since 2006 and was their first winning season since going 6-5 in 2007. Lickert knows he and his staff have some work to do to keep things on the upswing in Alexandria. The Camels graduated talented dual-threat quarterback Tyler Durham among others. Durham rushed for 1,829 yards on 262 carries and 25 touchdowns for an average of about seven yards a carry and completed 75-of-154 passes for 1,371 yards and 12 touchdowns with just four interceptions. Despite the loss of Durham, Campbell County still plans to run a spread offense. Then defensively, the Camels play to run multiple versions of the 3-3 stack. They do not have players going both directions. Lickert credited some of the turnaround to the Campbell County Youth Football League. The Camels have 35 juniors on the squad this year. Of them, Lickert said 30 played in the CCYFL. Lickert came to Holmes in 2007. The Bulldogs had not been to the playoffs since 2002. Lickert guided Holmes to a record of 24-20 in four seasons with two Class 4A, District 5 championships and their first playoff win since 2001 with a 42-0 win over East Jessamine in the first round of the playoffs in 2009. Lickert first became a head coach in 2004 at Dayton taking over a program that endured consecutive 1-9 campaigns. He guided the Greendevils to a 13-18 mark. The 2006 team finished 6-5 losing 45-6 to Beechwood in the first round of the playoffs. That marked the first playoff appearance for the Greendevils since 2002. When not coaching, Lickert teaches Business Classes at Campbell County High School. That included a Leadership Dynamics class last year. Lickert’s wife Sarah is from Lawrenceburg, Indiana. The couple has been married for three years and has a 1-year-old son Finn. Lickert credits his family for understanding the time commitment to coaching. Lickert helped Highlands to the state championship in 1996 when the Bluebirds knocked off Hopkinsville, 21-14 to win the Class 3A title. His former head coach Dale Mueller is proud of his coaching success. After graduation, Lickert played college football down Interstate-75 at Georgetown College as a linebacker. He helped the Tigers to a national championship in 2000. Campbell County opens the season Aug. 23 against Newport at 7 p.m. in Alexandria. But the following week, the Camels travel to Fort Thomas to face the Bluebirds at 7 p.m. This will mark the first meeting between the two teams since 2004 and the third time Lickert has coached against his alma mater. 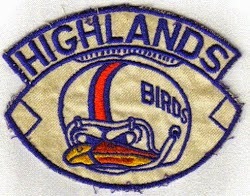 Highlands beat Holmes, 70-6 and 52-14 in 2008 and 2007 respectively when Lickert was head coach.